Do you love paper? Not a problem. Despite the accelerated digitisation of operations, some companies and individuals still prefer paper. Although this is perfectly fine, the amount of paper documents in today’s companies is growing and the laws state that they should be kept for extended periods of time. Mikrografija is here to help you with a comprehensive solution for a secure physical storage of your documentation. Mikrografija can also help you arrange physical storage of documents. The service is provided at legally compliant premises furnished with suitable control systems. More than 10 highly trained employees, who have passed an exam that qualifies them to handle documents and who have over 25 years of experience, guarantee that the documentation will be stored for the long term in a safe, legally compliant way, accessible only to authorised users. If harmonising legal requirements and regulations with your document archiving and handling needs is a challenge for your company mainly in terms of space, we are here to help. We realise that many organisations simply do not have suitable premises, nor the knowledge or the resources to provide a safe storage for business documents. Storing them in highly secure facilities (kept under surveillance), which you can access whenever you need your documents, is the smart thing to do. If a company aims to ensure efficient and truly safe archiving of documents, retaining a comprehensive archiving service from an outsourced provider is certainly one of the better options available. Why? Because the documents will be handled by specialists. 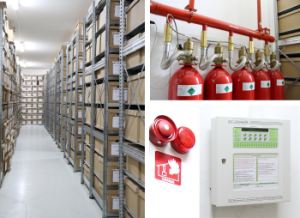 Thanks to high standards in quality and safety, Mikrografija is able to provide long-term storage, document maintenance and retrieval during storage, as well as any document disposal in line with the retention periods. An outsourced archive management service lowers operating costs, saves time spent on handling the documentation and decreases the requirements regarding the space designated for physical archives, i.e. enabling you to use your business premises more efficiently, namely for business. Mikrografija can also help you organise your own archive. The service of implementing an archiving system at the client’s location ensures comprehensive document management, even on a daily basis, if necessary. In such cases, all paper material remains at the client’s location, while the archive management is taken over by Mikrografija, providing the service at the client’s storage facility. Added value – the documents are close to the users, while the extensive expertise of Mikrografija’s specialists optimises the internal document archiving process. Why chose an internal archive? These are flexible solutions that can be customised for the most challenging environments and user requirements. suitably selected and handed over to the competent archive (if necessary). other protective equipment (e.g. for protection against rodents and insects, temperature and humidity measuring system etc.). We also provide disposal in the presence of a commission for archival material and documents after their statutory retention period has expired. For more information, please call 080 51 15 or contact us via e-mail. I would like a quote for physical storage.